You might listen to CDs and local radio. But more and more, you're tuning in to all the other music out there. Thousands of Internet radio stations. 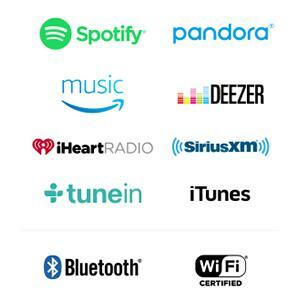 Music services like Pandora and Spotify. Here's the system that plays it all. The Wave SoundTouch music system connects to your home Wi-Fi network so you have everything you need. And it can be part of a complete family of wireless products that work together to play music throughout your home- the same music in every room, or different music in different rooms. All delivered with the rich, room-filling sound of Bose. And now it has a fresh, updated design- with Bluetooth built in - so you can stream music from your smartphone and tablet, too. 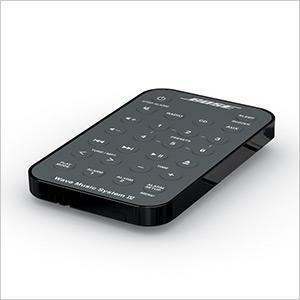 Six station presets on the unit itself and on the remote let you access your favorite music at the touch of a button. Powerful SoundTouch app for your smartphone, tablet, or computer. Add more SoundTouch systems at any time for a multi-room listening experience. 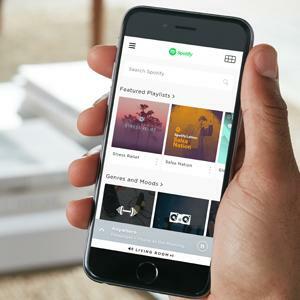 Tap into millions of songs from Internet radio, popular music services like Spotify and Pandora, plus your own music library, wirelessly. 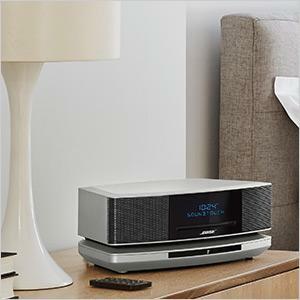 You'll enjoy your favorite music in a whole new way, thanks to Bose exclusive waveguide speaker technology. The audio performance- from prominent lows to crystal-clear highs- is something you just don't expect from a speaker this size. Turn the volume up or down. Change tracks. Find out what’s playing. 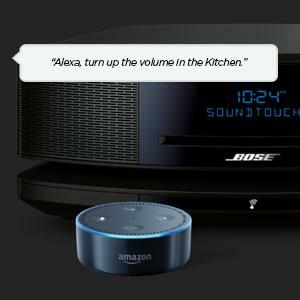 And even control where it’s playing—from the speaker in your kitchen to the speaker in your bedroom. Compatible with Amazon Music, Pandora, iHeartRadio, SiriusXM and TuneIn. Transform your tablet or smartphone into a powerful remote that lets you explore, organize and control your music. And keep your favorite stations, playlists, or albums always on standby with six presets. A snooze control easy enough to trigger in your sleep- just tap the top of the system. Dual independent alarms let early birds rise without having to reset the wakeup time for a late-sleeping partner. Nice. And practical. A slim infrared remote includes six presets for instant access of any combination of your favorite AM/FM or SoundTouch selections. 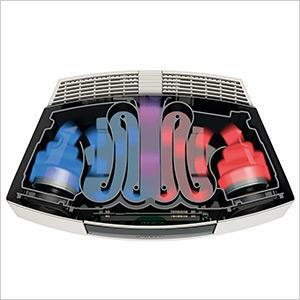 Also controls power, volume, track selection, alarm functions, and more.